Comodo Internet Security records a history of all actions taken by the firewall. Firewall 'Events' are generated and recorded for various reasons - including whenever an application or process makes a connection attempt that contravenes a rule in your Rule sets or whenever there is a change in Firewall configuration. 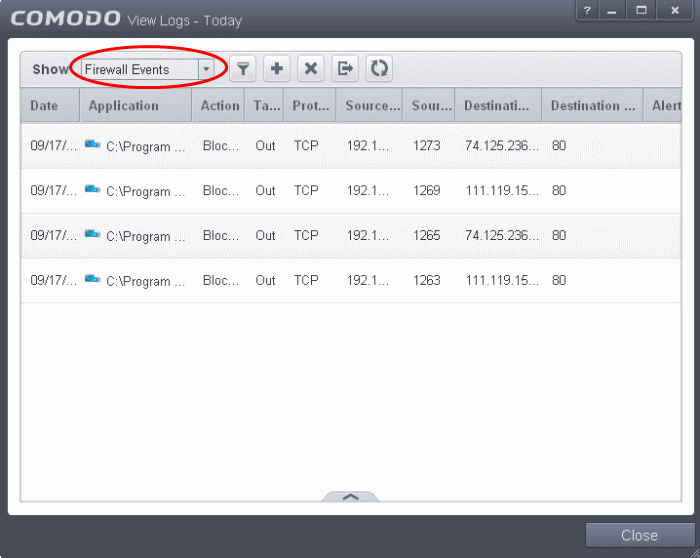 The Firewall logs can be viewed by selecting 'Firewall Events' from the 'Show' drop-down of the log viewer interface. Alternatively, the Firewall log screen can be accessed by clicking the number beside 'Network Intrusions' in the Advanced View of the Home screen in the Firewall pane. Date - Contains precise details of the date and time of the connection attempt. Action	- Contains the flags attached to the events, indicating how the firewall has reacted to the connection attempt. Target - Indicates whether the connection attempt is inbound or outbound. Protocol - Represents the Protocol used by the application that attempted to create the connection. This is usually TCP/IP or UDP - which are the most heavily used networking protocols. To export the Firewall logs as a HTML file click the 'Export' button . To refresh the Firewall logs, click the 'Refresh' button . To clear the Firewall logs click the 'Clear' button .